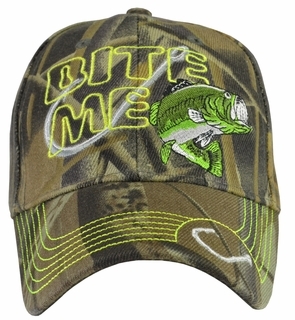 Fishing will be much so more fun when your wearing our awesome BITE ME Fishing Camo Baseball Cap. Embroidered on the front with BITE ME in neon letters as well as fishing hooks and a big mouth bass. On the back is BITE ME on the adjustable back strap. The hat is one size fits all made of 100% acrylic.